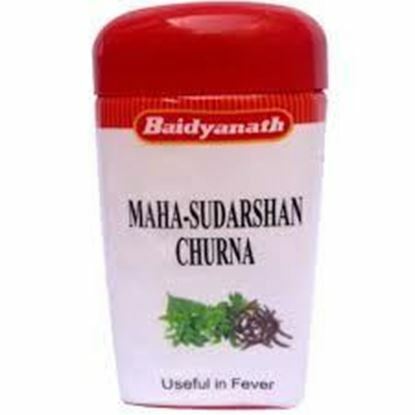 Ingredients Baptisia Bryonia Eucalyptus Gelsemium Lycopodium Action of Individual Ingredients Baptisia: Great muscular soreness, Heat all over, with occasional chills. Chill about 11 am. Bryonia: Rise of temperature of body marked by gastro-hepatic complications. Internal heat. Vomiting of bile and water immediately after eating. Eucalyptus: Elevation of temperature. Continuous high temperature with relapses. Gelsemium: Heat and sweat stages, long and exhausting. Nervous chills. Sensation of emptiness and weakness at the pit of the stomach. Heaviness of head, dizziness, faintness. Lycopodium: Chill between 3 and 4 pm, followed by sweat. Icy coldness. Feels as if lying on ice. One chill is followed by another. Pain shooting across lower abdomen from right to left. Dosage 10 to 15 drops in little water before every meal four times a day or as described by the physician. Terms and Conditions We have assumed that you have consulted a physician before purchasing this medicine and are not self medicating. Properties FormDrops Weight60 (gms) Dimensions3 (cm) x 3 (cm) x 9 (cm) FOR VARIOUS TYPES OF BACTERIAL AND VIRAL INFECTIONS IN THE BODY Acute bacterial and viral infections can be treated successfully with the help of ADEL 87 (apo-INFEKT) drops, which work as an immune system stimulant and biological antimicrobial to eliminate pathogens. The antibacterial qualities are essential for treatment of acute infections of the bladder, kidneys, bronchials and other organs. 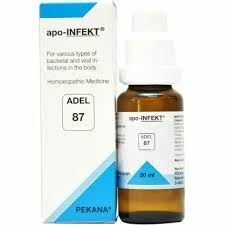 All pus- producing infections such as bronchitis, tonsillitis and otitis media indicate the need for ADEL 87 drops, which also stimulate the lymphatic system and address accompanying symptoms such as fever and weakness. In addition, ADEL 87 drops treat intestinal tract infections to help neutralize toxins. For prevention and treatment of bacterial and viral infections: flu, measles, chicken pox, otitis, candidosis, herpes simplex, mouth thrush. Ailanthus glandulosa 6X, Argentum nitricum 6X, Cinchona pubescens 6X, Echinacea 12X, Lachesis mutus 12X, Marrubium vulgare 8X, Nasturtium aquaticum 8X, Vincetoxicum 8X. Ailanthus gladulosa eliminates infections of the tonsils and other tissues, including those caused by foci or residual intoxification. It also helps treat severe weakness and fever, Scarlet Fever, mucus membrane infections, and dysbiosis of the digestive tract, including colic that may accompany this condition. Argentum nitricum helps treat infections in several different ways. Argentum functions as an anti-bacterial medication, while Nitricum acidicum treats infections of all mucous membranes. As a combination of the two, Argentum nitricum also helps regulate nerve function and combats restlessness/exhaustion often accompanied by headaches or migraines. Cinchona pubescens (China) specifically addresses fever, exhaustion and weakness. 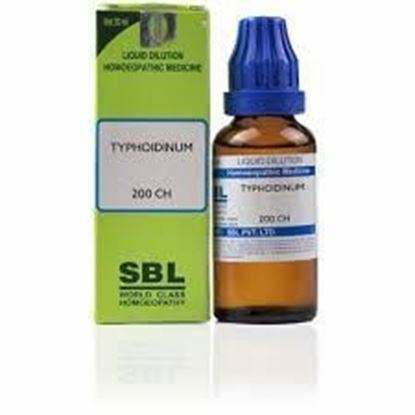 Its anti-infectious properties effectively help treat a broad range of illnesses from bronchitis, pertussis (whooping cough), gastritis and cholecystitis to polyarthritis rheumatica. In addition, China is also invaluable in reducing head congestion, as well as stopping bleeding from irritated mucous membranes. Echinacea is the classic herb of choice for stimulating the body's immune response and treating bacterial and viral infections. Leukocyte production and other defense responses are stimulated. In addition, it increases the excretion capabilities of the kidneys and intestines, which promotes more efficient elimination of toxic metabolic waste products. Lachesis mutus functions as a reliable medication against all septic conditions of the blood and protects the entire body against the spread of infection. Marrubium vulgare is a specific lymphatic stimulant indicated for treatment of severe respiratory infections, hardening of the lymph nodes, disruption of the liver and mucus membrane conditions. Nasturtium aquaticum is valuable for treatment of urological infections because of its diuretic properties, and for stimulating the gallbladder. It detoxifies the blood and works throughout the entire body as a natural antimicrobial. Traditionally this herb has been used to effectively treat skin disorders and prevent goiter. Vincetoxicum is an effective anti-virulent against infections ranging from flu and the common cold to poliomyelitis. It also aids the body in excreting toxins to help prevent development of debilitating chronic infections that may arise from acute illnesses that were not properly treated. Adults - 15-20 drops, Children - 7-10 drops, 3 times a day in 1/4 Cup of water. 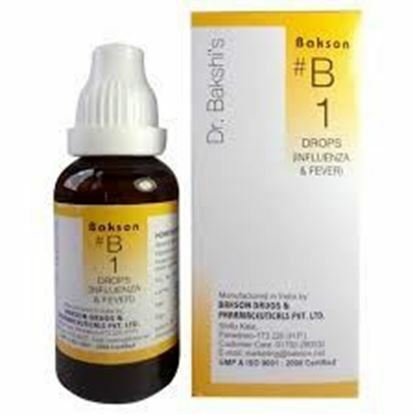 Properties Weight85 (gms) Dimensions3.8 (cm) x 3.8 (cm) x 9.6 (cm) Dr. Bakshi Baksons B1 Drops Influenza & Fever Influenza is a viral infection, commonly people call it as Flu. The flu causes a fever, body aches, a headache, a dry cough, and a sore or dry throat. It includes malaise, bodyache and muscular soreness as well. 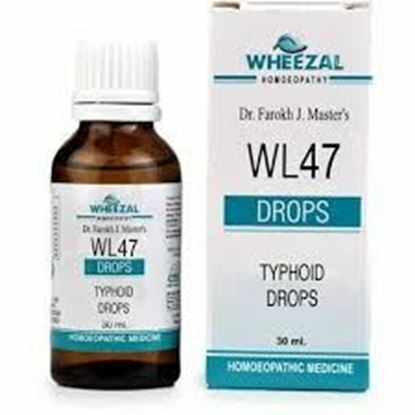 Properties Weight85 (gms) Dimensions4 (cm) x 4 (cm) x 9 (cm) Wheezal WL-47 Typhoid Drops Typhoid fever is an acute illness associated with fever. Typhoid fever is contracted by drinking or eating the bacteria in contaminated food or water. Indication Poor appetite, Abdominal pain, Headaches, Generalized aches and pains Fever, often up to 104.